Simply Sofas are proud to offer the excellent New Carlos 3 & 2 Seater Sofa Set Black or Brown Faux Leather. With so many on offer recently, it is wise to have a name you can recognise. The New Carlos 3 & 2 Seater Sofa Set Black or Brown Faux Leather is certainly that and will be a superb acquisition. 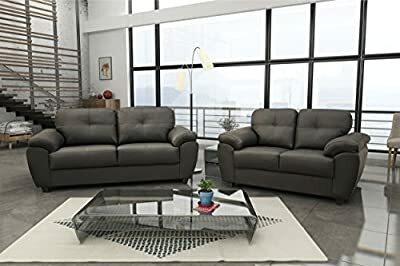 For this great price, the New Carlos 3 & 2 Seater Sofa Set Black or Brown Faux Leather is highly recommended and is a popular choice amongst lots of people. meble Roberto sp zoo have included some nice touches and this results in great value. Elegant and comfy Sofa Set 3 & 2 seater in synthetic leather ending up. Colour offered: Black and Brown. Seats with extremely thick and high density foam. Back cushions are silicone fibre filled and are detachable. Dimensions 2 seater: Length: 154cm, Heigh: 93cm, Depth: 83cm; Dimensions 3 seater: Length: 195cm, Heigh: 93cm, Depth: 83.